Modern buyers demand pretty much high standards from full-size half tone trucks. The priority of course are capability and performance. But they also want comfortable ride, good fuel economy, the latest technology and touch of luxury is also welcomed. Ford has unmatched talent to deliver all that and it has been dominating figure in this class for decades. Its diverse lineup of this top-selling model covers every possible wish of the buyers. However, for those who want a bit more of the luxury equipment and styling the 2017 Ford F-150 Platinum might be the perfect solution. 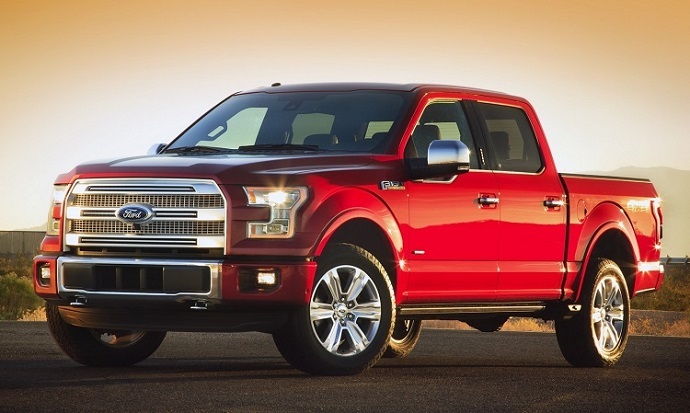 The Platinum trim is close to the top of the F-150’s lineup. It sits the step below the Limited version. This variant is available in the Super Crew style only. This cab version comes with two bed lengths including 5.5 foot and 6.5 foot beds. As for the engine options the Platinum model offers two options as well. Standard is 5.0 liter V-8. As option buyers can get new 3.6 liter EcoBoost engine. Like every version of the latest F-150 generation the 2017 Ford F-150 Platinum features fully-boxed frame and aluminum-made body panels. However, what distinguish it from other versions are uniquely stylish exterior and interior plus more luxury equipment. From the visual point of view the dominating element on this model is unique grille. It has three-bar style with satin-finish surround and mesh insert also finished in satin. This model also has quad beam LED headlights and LED taillights . There are also fog lights, chrome front bumper, body color rear bumper, chromed door handles, heated side mirrors, power running boards, tow hooks, etc. The model rides on unique 20-inch aluminum wheels. Inside the model features unique genuine wood trim inserts. Multi contour bucket front seats provide ultimate comfort and heating and cooling functionalities. They use leather upholstery and 10-way power functionality. Other comfort features also include driver memory setting, heated rear seats, power heated tilt and telescopic steering wheel, dual zone automatic temperature control, etc. This model also includes ambient lighting, all-weather floor mats, 110 volt power inverter instrument panel, etc. Techwise, the Platinum models benefits from an 8-inch productivity screen which displays important information like towing data, fuel economy and so on. There is also standard Sync3 infotainment system, satellite and HD radio, voice activated navigation and more. For the safety and security the model uses AdvanceTrac with roll stability control, My Key system, keyless entry, remote start, tire pressure monitoring, blind-spot and cross traffic alert, etc. Safety options are lane keeping system, surround view cameras, adaptive cruise control, etc. Standard engine on the 2017 Ford F-150 Platinum is naturally aspirated 5.0 liter V-8. This proven engine can produce 385 hp and torque of 387 lb-ft. Transmission system with this engine is six-speed automatic. Two-wheel drive is standard and four-wheel drive optional. With this configuration you should expect 18 mpg combined fuel economy. Peak towing capacity is 11, 100 pounds. As option, the Platinum model includes redesigned 3.5 liter turbocharged V-6. This engine combines stop-start technology, direct and port injection, variable cam timing and turbochargers for the additional power and efficiency boost. It is good for 375 hp and torque of 470 lb-ft. A new 10-speed transmission comes with this engine. This powertrain returns 21 mpg combined and allows up to 12, 200 of towing capacity. The price of the 2017 Ford F-150 Platinum starts from $52, 835.